Oranges have long been a symbol of health and vitality, in part because of their vibrant color (what fruit could be that color and not be good for you? ), but mostly due to their reputation as the king of vitamin C. While many fruits and vegetables are a source of this potent antioxidant, few offer such a wide range of health benefits as the smile-inducing orange. We’ll kick things off with an oldie but goodie. Everyone knows that oranges are an excellent source of vitamin C, but it’s worth discussing nonetheless. The average-size orange provides approximately three-quarters of your daily vitamin C needs. Eating additional fruits and vegetables makes it easy to meet your daily requirement of vitamin C.
Getting your daily quota of vitamin C means that you’re supplying your body with one of the most critical antioxidants, responsible for protecting your cells against free radical oxidative damage (and hence slowing down the process of aging), reducing inflammation in joints and muscles, and bolstering your immune system so that you’re more resistant to colds, flu, and other illnesses. Vitamin C isn’t the only antioxidant contained within the humble orange. Oranges are also high in vitamin A, which supports healthy eye mucus membranes. Comprised of the compounds lutein, beta carotene and zeaxanthin, the vitamin A found in oranges protects against macular degeneration associated with aging. According to the American Macular Degeneration Foundation, macular degeneration “is the leading cause of vision loss, affecting more than 10 million Americans — more than cataracts and glaucoma combined.” Another good reason to eat oranges! Here’s one for the guys — the potent concoction of antioxidants found in oranges helps to support the production of healthy, more motile sperm. This means that if you’re trying to conceive with your lady, consuming oranges will improve your fertility, and hence your chance of reproductive success. Throw in the folic acid found in our friend the orange, and you’ll be further promoting healthy sperm and protecting them from genetic damage. Once again, the high concentration of vitamin C found in oranges comes to the rescue. This time, it’s with regards to your cardiovascular health. The free radical damage we mentioned earlier can result in the oxidation of cholesterol, causing these molecules to stick together and adhere to the walls of your arteries. The buildup of plaque can ultimately block the flow of blood and put you at risk of heart attack, stroke or heart disease. Vitamin C is a known enemy of oxidative damage to cells, neutralizing free radicals while simultaneously lowering inflammation and keeping your cholesterol levels healthy. Oranges contain a curious compound called D-limonene, which can play a pivotal role in preventing the development of certain types of cancer, including lung cancer, breast cancer and skin cancer. The antioxidants found in oranges also help in the fight against cancer, strengthening the immune system to wage war against potentially cancerous cell mutations. The folic acid and vitamin B9 contained in oranges promote healthy brain development, while the polyphenolic compounds also contained in oranges support the development of learning and memory functions in the brain. The same orange-derived folate that promotes brain development in adults and sperm health in males can also provide an important nutrient for pregnant women, lowering the risk of neurological disorders in the developing fetus. Putting plenty of food in, but not seeing any result on the other side? Oranges can help with that. The high levels of both soluble and insoluble fiber found in this colorful fruit support a healthy stomach and digestive tract. This fiber adds bulk to digested food and speeds up the transit time of food in the digestive tract, thereby fighting constipation and making your time on the toilet a whole lot easier. Not only that, the high levels of fiber in oranges help to prevent the development of irritable bowel syndrome (IBS). Oranges are similar to lemons in that, when consumed, they help to balance the pH of your body by providing a range of alkaline minerals. An acidic environment in the body provides the perfect conditions for disease and health problems. These minerals help to redress the pH balance in the body. It might seem a little counterintuitive, considering oranges contain high levels of citric acid, but you’re going to have to trust us on this one. It’s important to note that while oranges are very healthy, they are also one of the most pesticide-sprayed fruits on the market. For this reason, try to go organic whenever possible — not only is it better for your health, it’s better for the land, too. Hey Buddy!, I found this information for you: "Eat this Orange Fruit to Protect Yourself from Heart Disease". 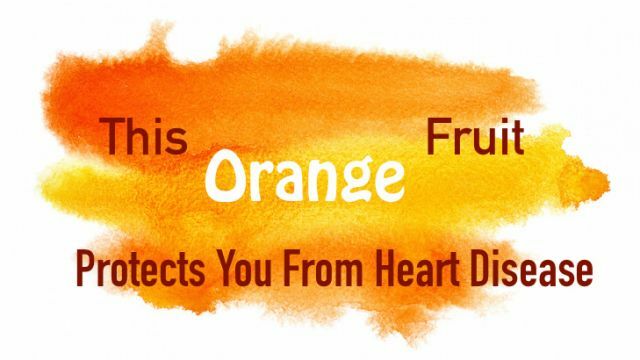 Here is the website link: https://www.thealternativedaily.com/eat-this-orange-fruit-to-protect-yourself-from-heart-disease/. Thank you.